Justin Trudeau’s brand of liberal diplomacy is finding some success with the global response to Venezuela’s crisis, even as it falls flat elsewhere. The Canadian prime minister’s top diplomat, Chrystia Freeland, is working behind the scenes to sound the alarm over the authoritarian government of Nicolas Maduro -- all while she tries to douse other fires abroad. China, for example, bristled at Trudeau’s virtue signaling on trade even before the arrest of a Huawei Technologies Co. executive exploded into a crisis. To pressure Maduro, the Canadians hosted meetings of Venezuela’s neighbors expressing joint concern, offered early support for National Assembly leader Juan Guaido and rallied other countries to speak up. Tentative headway on Venezuela comes amid other foreign policy headaches. Canada now faces an investment freeze in Saudi Arabia, thanks to human rights advocacy; a Trudeau visit to India was roundly mocked; and the U.S. balked at his progressive agenda in renegotiating the North American trade pact. While the China and Saudi feuds lay bare the vulnerability of Canada’s economy in a multipolar world, the challenge to Maduro’s leadership is perfectly suited to Trudeau’s vision of middle-power diplomacy. It comes without much risk given Venezuela’s scant leverage against the northern nation. Canada’s energy industry could even benefit from U.S. sanctions against Venezuela’s state-owned oil company, as Gulf Coast refiners look north to fill the gap. Canada was a founding member of the Lima Group, struck in 2017 to press for reform in Venezuela, and the only one outside Latin America given the U.S. was excluded. The 12 countries met regularly, including a session in Canada that year after Trudeau sanctioned Maduro and other Venezuelan officials accused of human-rights abuses. It’s been important for Canada to work with Venezuela’s biggest neighbours, Brazil and Colombia, as well as Chile, Argentina and Peru, “so that this is seen as a regional Latin American response and not a gringo response,” said Ben Rowswell, ambassador to Venezuela from 2014 to 2017 and now president of the Canadian International Council, a foreign relations advocacy group. Rowswell’s successor at the embassy in Caracas was kicked out by Maduro’s government two months after Canada’s targeted sanctions. Freeland has been unusually active on the Venezuela file ever since. The foreign minister spoke with Guaido by phone on Jan. 9, privately voicing Canada’s support after two prominent opposition figures backed him as the consensus rival to Maduro, according to an official familiar with the call who spoke on condition of anonymity. Freeland didn’t specifically offer to back his interim presidency during that conversation, the official said. Freeland also discussed Venezuela with U.S. Secretary of State Mike Pompeo on Jan. 15. Canada’s government and other nations anticipated major protests the following week, on the Jan. 23 anniversary of Venezuela’s 1958 democratic uprising. When Guaido proclaimed himself interim president that day, the U.S., Canada and others quickly recognized him. The list includes Venezuela’s neighbors Brazil and Colombia, and all but one member of the initial Lima Group. Mexico, under new president Andres Manuel Lopez Obrador, continues to recognize Maduro while calling for dialog to resolve the situation. 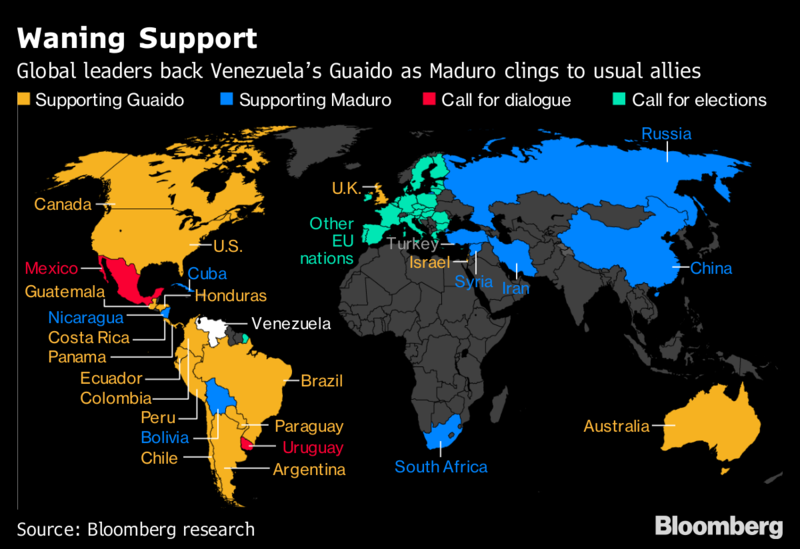 Support for Guaido is growing. The European Union has hinted it will back him unless there are new elections. Trudeau has been working the phones to raise the issue -- speaking this weekend with Pedro Sanchez of Spain and French President Emmanuel Macron. Rowswell said the Trudeau government’s position on Venezuela has been consistent with its message to other countries, including Saudi Arabia. Canada remains at odds with the kingdom, a dispute that’s having an economic impact: Shares in Montreal-based SNC Lavalin Group Inc. suffered a record plunge Monday in part because of the spat. China, meanwhile, balked at Trudeau’s push for labour, gender and environmental guarantees, and had warned of an investment chill after a blocked takeover of a construction company. That was before Canada’s arrest in December of Huawei Chief Financial Officer Meng Wanzhou. The U.S. filed its full formal extradition request Monday, and Canada is still pushing for the release of two Canadians seized by Chinese state security nine days after Meng’s detention in Vancouver. On Venezuela, Trudeau has some support domestically. The Conservative Party, his main opposition, condemned Maduro’s government as illegitimate. The left-leaning New Democrats, however, say Canada shouldn’t simply follow U.S. foreign policy. Against that backdrop, Freeland is preparing to host the Lima Group in the Canadian capital. “We now call upon Nicolas Maduro to cede power to the National Assembly, the only remaining democratically elected institution in Venezuela in line with that country’s constitution,” she said Monday.